Did tweeting get JetBlue passenger kicked off plane? A JetBlue passenger claims that her tweets got her removed from a flight. (CNN) -- Tweeting about why her Tuesday night flight was delayed got Lisa Carter-Knight kicked off a JetBlue airplane, she claims. An hour after JetBlue Flight 760 was scheduled to depart Philadelphia for Boston, a fellow passenger joked about the aircraft's alcohol supply. Another passenger joked about wishing for a fully stocked bar on the flight, Carter-Knight told CNN affiliate WPVI. The pilot misunderstood the joke and took it to be an accusation that he had been drinking. "The pilot ran out and said, 'That's it; everyone back up at the gate; I've been accused of being intoxicated,' " Carter-Knight said. That's when she turned to Twitter. "I went to Twitter to share my experience, not bad, just very strange, with my friends and my followers," she said. "JetBlue staff and the pilot did not like that tonight, and so I'm standing here at 1 o'clock in the morning because I was denied access to the flight." JetBlue says that's not true. "The customer was not kicked off because of her tweets," JetBlue spokeswoman Tamara Young wrote in an email. "There were other customers that also tweeted and boarded the plane. As we shared, it is not our practice to remove a customer for expressing criticism of their experience in any medium. This customer however was denied boarding due to unruly behavior and creating a disturbance by the gate area." CNN reached out to Carter-Knight via Twitter but has not heard back. 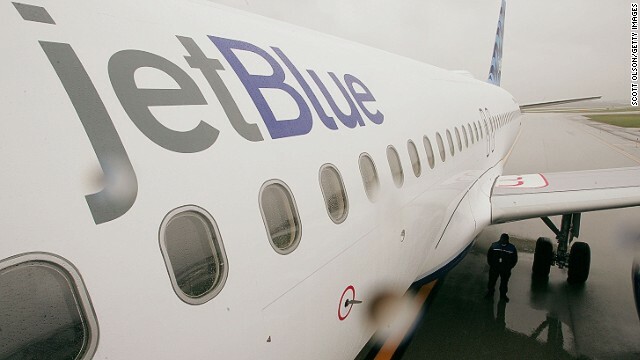 JetBlue confirmed that a customer accusation of the pilot being intoxicated delayed Flight 760 prior to departure. "As a precautionary measure, a sobriety test was conducted. The test demonstrated the pilot was sober and as a result, he was cleared to perform his duties. Customers boarded the aircraft which departed PHL at 12:03am and arrived in BOS at 1:12am." "The decision to remove a customer from a flight is not taken lightly," Young said. "If we feel a customer is not complying with safety instructions, exhibits objectionable behavior or causes conflict at the gate or on the aircraft, the customer will be asked to deplane or will be denied boarding especially if the crew feels the situation runs the risk of accelerating in the air. "In this instance, the customer received a refund and chose to fly on another carrier."